Invaluable warmth at a valuable price. 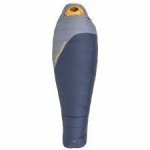 The Big Agnes Boot Jacket Sleeping Bag provides wet weather protection and lofty down for backpackers on a budget. Down insulation ensures lofty warmth without the weight, as well as the compact convenience that backpackers need. Big Agnes treated the down with DownTek to retain its lofty warmth in moisture-riddled environments, and the shell has a water-resistant treatment to shed liquids for even more protection. Big Agnes styled the Boot Jacket with a weight-saving mummy shape, and the contoured hood has a drawcord to ensure a snug fit as well. There are draft tubes around the collar and inside the full-length zipper to seal out winds. This sleeping bag also has internal loops for liners, and external loops for airing out. Big Agnes included a stuff sack for the pack and a storage sack for the garage.